We moved into our new home less than 8 weeks ago. While there is so much to do still, everything is coming together really well so far. For those of you who don’t know *although I don’t think I said it officially on the blog* but my husband and I designed this house from scratch. While I feel extremely fortunate and blessed that we had the ability to do so, the process also came with lots of headaches and roadblocks. We plan to do a video home tour which we’ll talk more about the experiences. However, that video will have to wait until a later date. Work has been very hectic of late for both of us. In the meantime, I hope you enjoy a little sneak peek into our new home. 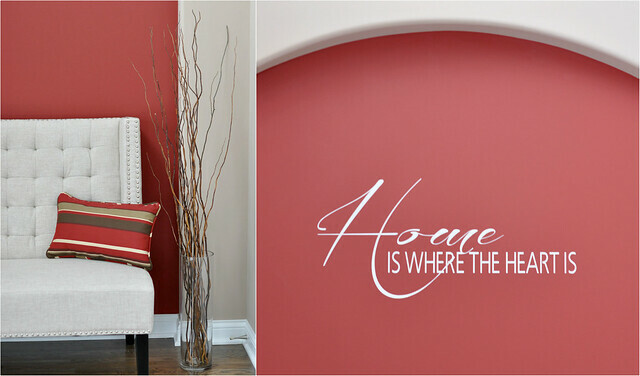 I wanted to create a warm and inviting atmosphere where guests enter the house. 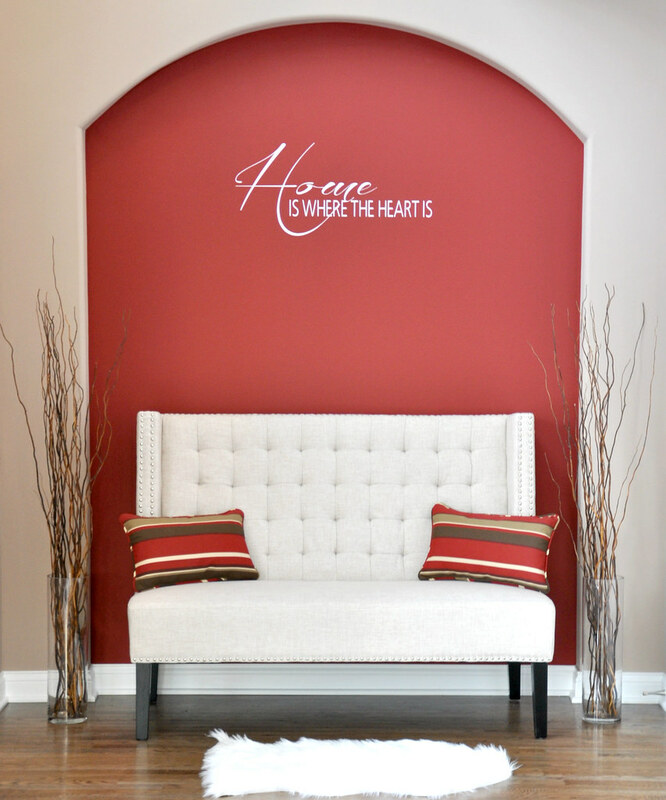 The beige and burgundy color combination does a great job of making this area feel cozy and welcoming. A little faux sheepskin rug pulls everything together. I really love the way this area turned out. It's modern and clean with a touch of glam. Wow, it's lovely! I cant believe that you designed all that yourselves. We often thought about doing that since we had trouble finding a house we truly love, but after seeing several of our friends going through that process, I dont think our marriage can survive the stress. Bravo to you and your husband. Thanks for sharing, I cant wait to see more. Looks amazing, you guys did an amazing job creating a very special space! love how open the foyer is!!! and the burgundy is definitely a crisp pop of color that isn't overwhelming. looking forward to seeing the rest of your home tour! You have amazing taste Sydney! Just love how the foyer came out. You have such a big and gorgeous foyer! Oh, Sydney, this is beautiful! The colors, that bench, the cute wall decal — perfect! I left my comment went to spam - I love how the red ties everything together. The couch is a great choice! And love the rug and the applique on the wall. Awesome decorating/home design choices. 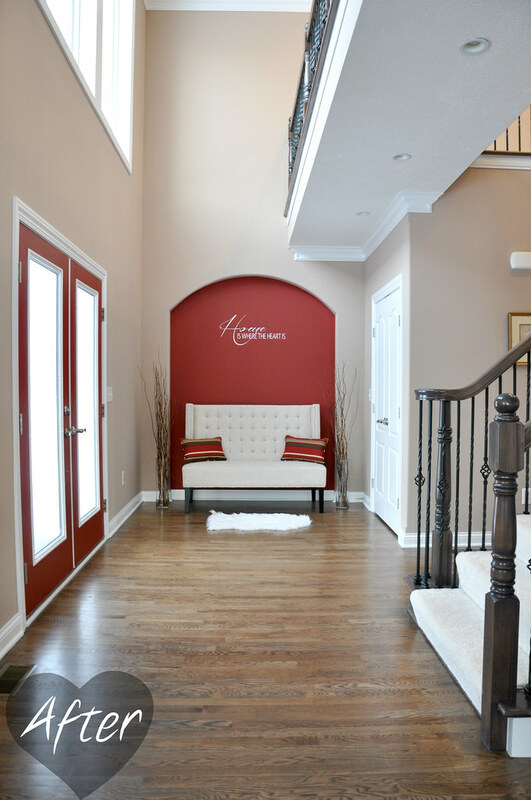 The foyer is gorgeous...love the red accents. 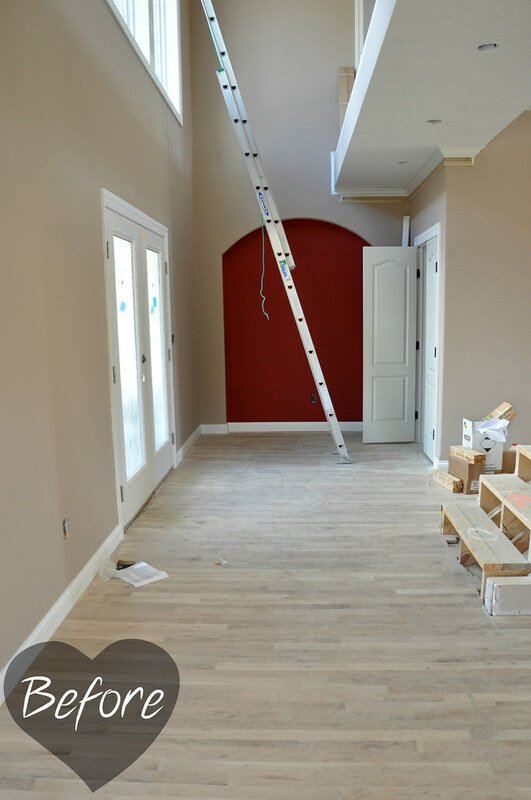 Also love the high baseboards. Very interested in a home tour! We our looking at real estate right now, so decorating ideas would be great! great decorating!! i love the script on the wall and the whole space is so inviting! Honestly, that rug is incredibly impractical for a foyer. You should find a functional yet beautiful option, and return that rug so it doesn't end up in the landfill from an unsuccessful try. I'm glad my blunt advice wasn't so bad as to cause you to tune out the advice. I'm a stay-at-home mom of two, so I honestly was cringing at the idea of you having to constantly wash that rug. Alternatively, guest might even have to side-step the rug in order to sit down at the bench (which I imagine is incredibly inconvenient). I'd go with a rug made of either low maintenance material or material that you can rough up through cleaning and still come out looking new and decent. Since you have carpet, why not look at smaller area rugs from say Pottery Barn or Restoration Hardware for inspiration? Those stores offer styles that seem to align with your own. You could always use a carpet cleaner to clean an area rug along with your carpet. @Anonymous @Anonymous I appreciate you taking the time to leave me feedback. Don't know if we're going to change anything right away but will keep those ideas in mind.